© This Page and contents are the sole rights of the Author and may not be copied without permission. Astronomy & Astrology of eclipse paths. A strange peculiar narrative is unfolding? It has long been known, that life on earth is governed by the two Lights. The Sun, a yellow dwarf star, is the life giver of the solar system, and central to the philosophy of astrology. You properly noticed the tumultuous - chaotic circumstance that have been present throughout this year. This disorderly restless atmosphere commenced around Mid-February 2016, peaking in mid-June. I did post on my FB page a allegorical statement about this passage of time! "Mars is running from the Fire back to the Iron gates & into the murky waters that surround!" A cryptic message about the Fires of creation, a part of the sky that is full of Magic! Well the final act of this very strange set of astronomical theatrical heavenly affairs is upon us!!! In researching for this article I found myself going into some rather odd moments, call it "The unexplained"? What it all means, well I'm not entirely sure, however as I have mentioned before; "Astronomy of the sky is regulated and because of this it is Fated - we know astronomical events are going to take place, the science tells us that - However the astrological unfolding is at times surrounded in a symbolic cryptic fog. The job of an astrologer is make sense of the symbolic language. And sometimes we are taken to places where we don't quite know what to make of it. Well half of this story is one of those moments - the other half seems, well fairly predictable. The show gets started with a Leo the Lion New Moon on August 3, 2016. 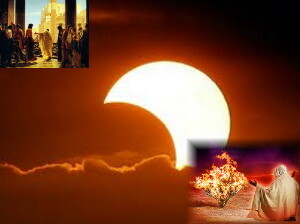 This lunation see's Mars again enter the Fire (Sagittarius). 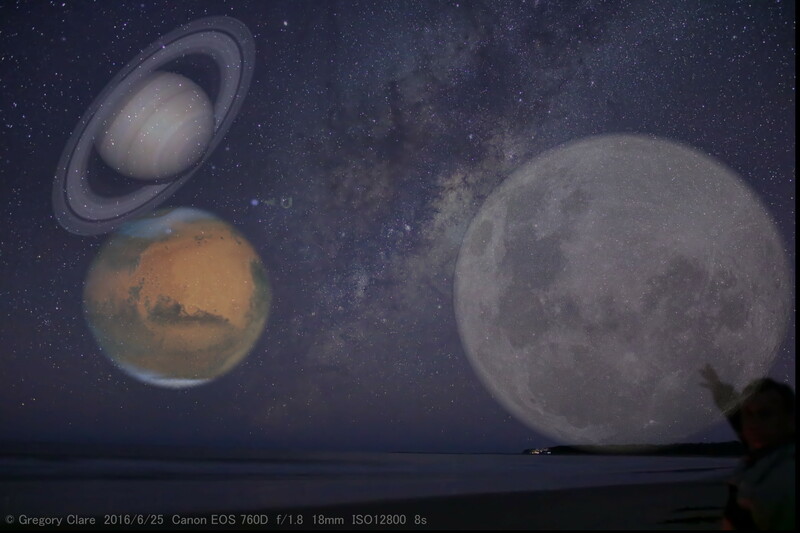 Mars was heading towards this inauspicious encounter with Saturn way back in April 2016, however it took another route to get there (retrograde). And now Saturn is heading back towards (retrograde)Mars. Before this rendezvous encounter on August 24th, a Appulse Lunar eclipse will take place on August 18, 2016. Ok what's a Appulse Lunar eclipse? Well the short answer is a Lunar eclipse that is not really a Lunar eclipse. Sounds strange - well this whole story is rather strange - An Appulse eclipse is a result of the Nodes of the Moon - The orbital plane of the Moon is tilted at 5.5 degrees to the ecliptic - this results in the Moon appearing to traverse up and down over the ecliptic. For an eclipse to occur the Moon who is responsible for an eclipse needs to be within a select amount of distance from the ecliptic. The Node - Nodes are the point where the Moon crosses the ecliptic. The apparent path of the Sun seen from Earth is the Ecliptic. If a Lunation - New or Full Moon takes place close to this select distance (18 degrees either side of the Node - Nodes, for a Solar & 12.5 degrees for Lunar eclipse) then an eclipse will take place. Solar Eclipses belong to families (Saros) that repeat every 18 years & 11 days, and take 1,280 years to complete a cycle. They can start at the North Pole and descend downward to the South Pole or start at the South Pole an ascend upward to the North pole in their allotted family Time. Why I'm telling you this? well it just so happens that on August 18, 2016 this Appulse Lunar eclipse, with the Moon at 25:51 degrees Aquarius, is the last of the astronomical series 109. This means the series is finished. This a very significant event & to make sense of this remember what happened to the events that surrounded you in 1944 - 1962 - 1980 - 1998 - 2016. The first Full Moon - Appulse Lunar eclipse on June 27, 736AD, Sun was 08 degrees 52' Cancer & the eclipsed Moon was 08:52' Capricorn. Keep that degree in mind. The North Node was 23 degrees Gemini, and Mars was partile to the node @ 23 degrees Gemini, Saturn was 18 Gemini. Notice anything - 23 Gemini ring any bells? Trump's Sun degree 22:51 Gemini - Natal Uranus 17:53 Gemini. The USA Independence Sibley chart 4th July 1776 -17:10hrs Philadelphia has Mars @ 21 Gemini and natal Moon @ 27 Aquarius. Additionally Trump's acceptance speech At the COP convention the Moon was 26:26 Aquarius. Also Trumps Mercury is 08 Cancer. Another feature is the peak period known as Total Lunar eclipse period of this series 109. This occurred in 1349, this peak began in 1331 with a Total Lunar eclipse @ 5 degrees Capricorn, additionally Mars was partile conjunct Saturn at 03 Virgo. Saturn was the ruler of the eclipse. On July 1, 1349 the longest total lunar eclipse of series 109 took place at 16 Capricorn, Mars was @ 15 Gemini and Saturn was 12 Aries. Coincidental occurrence may be ? The upcoming August 18, 2016, 109 Appulse lunar eclipse has what is referred to as Astro-Carto-Graphy (founded by Jim Lewis), astro mapping lines see the Moon line falling over Rio, & the Mars/Saturn/IC lines falling directly over Rio. The questioned must be asked what does this say about the Zika virus? Additionally on August 24, 2016, Mars co-joins retrograde Saturn as mentioned, this conjunction when set for the capital of the US - Washington see's Mars/Saturn on the IC with the chart mapping lines running through the capital.??? When an eclipse forms a path trajectory is projected onto the earth. This track has many varied principles that determines its behaviour. Take the upcoming eclipse on March 20, 2015. This eclipse behaviour is very erratic. The eclipse starts eastward, then turns northward, then northwest contraclockwise. And finally eastward, with a trajectory over the north pole. Astronomically this coming total solar eclipse is numbered saros 120. However astrologically it is numbered Saros 17 south. The astrological longitudinal degree is 29:27 Pisces. The path of saros 17 south finds it commencement in the North Atlantic ocean of the tip of Greenland. The eclipse then curves its way north-northeast, passing between Iceland and the United Kingdom. The eclipse then makes first contact with terra firma passing over the Danish owned Faeroe Islands. The eclipse then turns north-northwest, and reaches it greatest totality of 2minutes and 47 seconds over the Norwegian Sea. The trajectory then crossing the Arctic Circle. The eclipse tracks east again passing over many of Norway's major islands. Finally in a very extraordinary event the shadow moves through the Arctic ocean, and almost exactly leaves the earth on top of the North Pole. This final act is very special. At almost the exact time of the shadow departing the earth's plan, the Sun makes its first appearance over one of the remoteness places on earth. This auspicious moment coincides with the vernal equinox, the Sun is caught hanging over the Gateway to Life. The Sun at this instant is hovering over the horizon, as the atmosphere bends and refracts at the weight of such a grand splendour. Light tries so hard to appear, almost as if it is a rebirth. Interestingly this saros -(120) or 17 south, started on May 27 933os, at the South pole. Its repeating cycle of every 18 years, 11 days, contains 71 events. The series reached an annular eclipse on August 11, 1059. It was a hybrid event for 3 dates: May 8, 1510, through May 29, 1546, and total eclipses from June 8, 1564, through March 30, 2033. The series ends at member 71 as a partial eclipse on July 7, 2195. The longest duration of totality was 2 minutes, 16 seconds on August 12, 1654. The commencement degree of this Saros family of eclipses may prove to be very relevant in light of recent events-see (http://www.gregoryclare.com/astrologicalforecastfortheusa.html). The 933os, new moon partial eclipse was @ 9 degrees 56' Gemini. Also of interest is transiting Mars, it was rising at the commencement @ 00:41 Aries. According to (Bardy. B. Eagle & Lark -1992) this series is to do with projects & relationships - suggesting sudden, bringing together & understanding. This may well have some significants, although to me it suggest a real mixture of issues. Firstly,the Gemini doubled body, mutable airy energy in trine with stationary recently retrograde Saturn in the solid -fixed sign of Aquarius! These are human signs, which does tend to suggest negotiations that are bogged down perhaps moving ahead. This aspect of renegotiation (something from the past) is emphasized with Uranus/South Node/Jupiter in Taurus. However they are square RX Saturn with Mars in Aries at the equinox, must say something about the collective involvement. So what are the implication collectively and who will this eclipse have an influence on? Well the standout chart here has to be Russia. The eclipse not only surrounds the waters of the icy land, but more importantly when the chart is cast from Moscow it is directly over head. The eclipse touches partile to the MC. This suggests that counties capital & government will feel the full effects of this event! Making use of the Russian independence chart for December 8, 1991, there appears some dynamic hot choleric & cold melancholic aspects. Transiting Mars/Uranus are trine to natal Mars/Mercury/Sun. These same aspecting planets are also square Russia's natal Node/Uranus/Moon/Neptune, with transiting Pluto conjunct these natal Capricornia natal planets. Suggesting the Old vs. the New. 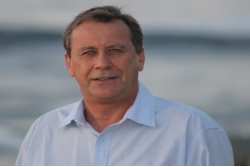 The most outstanding aspect comes from - The Commonwealth of Independent States (CIS) chart. (Campion. 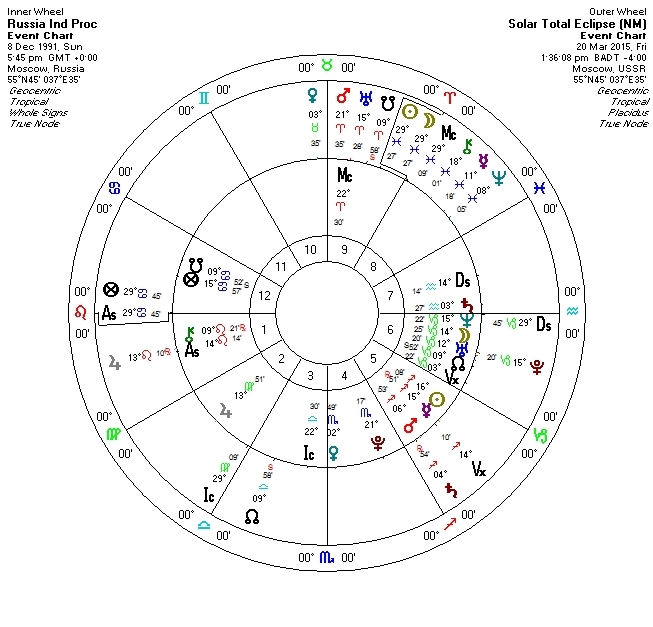 N. World Horoscopes, 2004) This chart of 21 December 1991, features a 28:42 Gemini natal Moon, which will square the eclipse Sun/Moon and the MC, projected from Moscow. Considering the recent events in Ukraine this must alert us to take note of the other independent states positions. 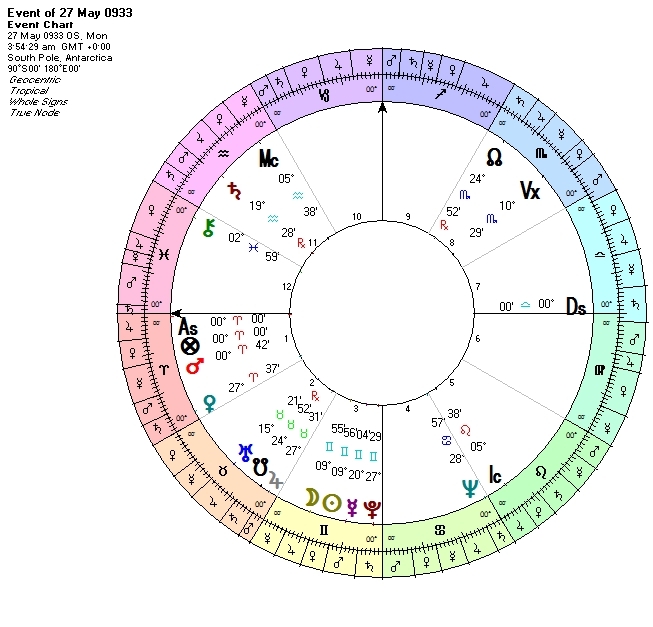 This chart features natal Mars @ 16 Aries & natal Sun at 29 Sagittarius. This is very concerning and very problematic for the leaders. Another state in the Path and who's natal chart will be triggered will be Russia neighbour, Iceland. Again Campion gives , January 17, 1944 as the independence, which places natal Saturn @ 29:39, Gemini. This chart is very intriguing with respect to the 933os chart. The chart features a stellium of planets -starting with Uranus @ 9 degrees Gemini, Mercury 10, Venus 23, Sun 26, Saturn at 29, & Mars @ 15 Leo. There are many other nations who's chart will be thrust into the limelight, those who have oppositions to 29 Pisces, 29 Virgo, far too many to list here, suffice to say Germany is one that has connections. 00: Libra. Finally the closeness of this eclipse to the vernal equinox says something very strong collectively! All cardinal points will be triggered - 00 Aries, Cancer, Libra & Capricorn. The Comments on this Page are not to be taken to mean any harm or injury to any person or place. They are written solely as entertainment.